Posted by Nick Prescott on 5 June, 2017. 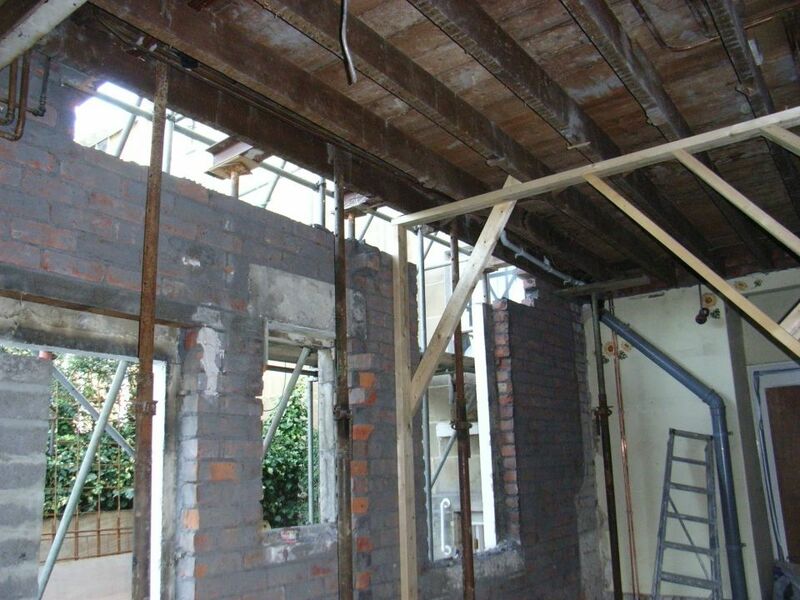 If you are considering a structural steel for a house extension, we examine here a few options. The choice is usually between setting the steel below the ceiling line or fitting it within the floorspace above. In this blog, we review briefly how a structural engineer calculates steel size and how you might decide where to fit it. We also look at a cranked steel example with adjacent ceilings at different levels. Wherever possible, we look to set the steel within the depth of the upper floorspace. This gives a nice, clean line without any downstand. 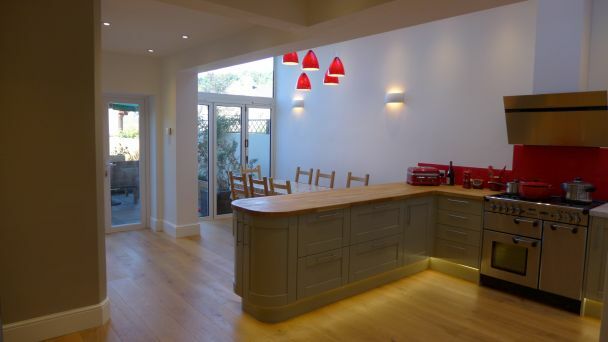 Particularly if your extension is double height, you want to feel that extra height as soon as you walk into the room. A steel below the ceiling reduces the sightline and gives a less impressive feel. In the example below, with the steel within the first floor depth, you can see the sharp edge formed between the original ground floor ceiling line and what was an original first floor outside wall. 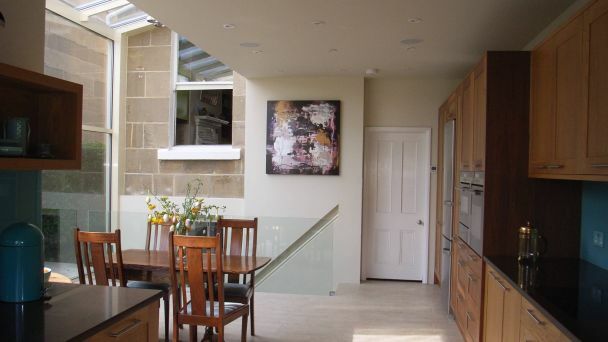 You can read more about this on our glass extension project page. Sometimes it is not practical to fit the steel in the floorspace above. 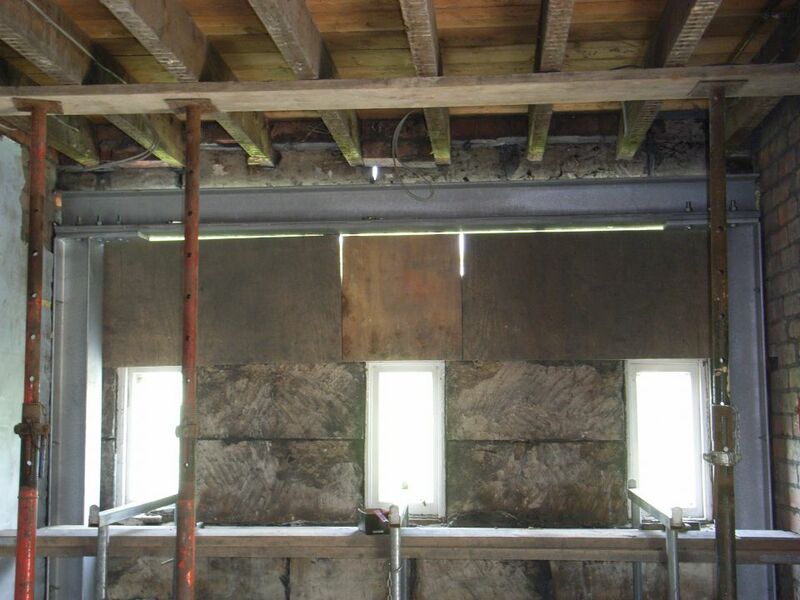 In the example below we were faced with two steels already in place below the ceiling when the original house was constructed; these support two walls on the first floor; you can see them in the photo pointing towards the window. We didn’t feel that the technical challenge and cost of raising those beams represented value for money. So we set our steel below the ceiling in line with them. The original steels were welded to the new, the wall removed, and the building extended outwards. A view of the welded connection between old steels and the new. 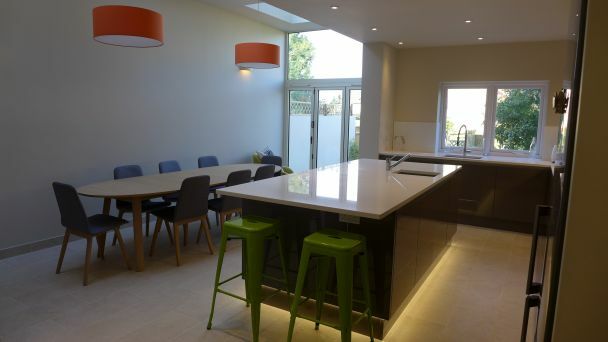 There is more information in our two-storey extension project report. One further example where it proved impractical to fit the steel completely within the floorspace above was where there was a doorway above the steel. 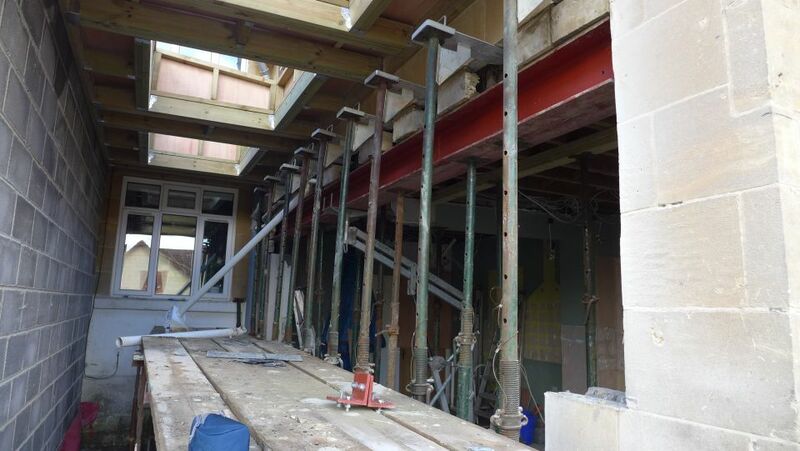 Most of the steel could still be lost in the floor, but we compromised on an 80mm dowstand to avoid the access. A structural engineer produces calculations and an installation method statement for the steel and its supporting piers. In many cases, he or she would need to assess the ground conditions more closely before finaliing the design. For this, we dig a pilot hole in the vicinity of the vertical structure. Depending on the ground stability found, the engineer may require additional underpinning of the supporting structure. 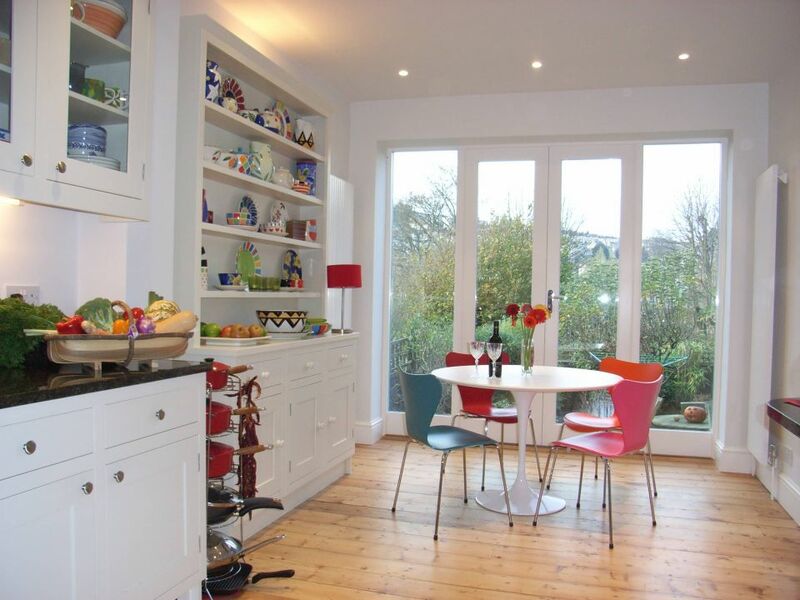 To spread the load on existing walls, a padstone may also be specified. In the image below you can see a padstone above the bricks on the far pier. 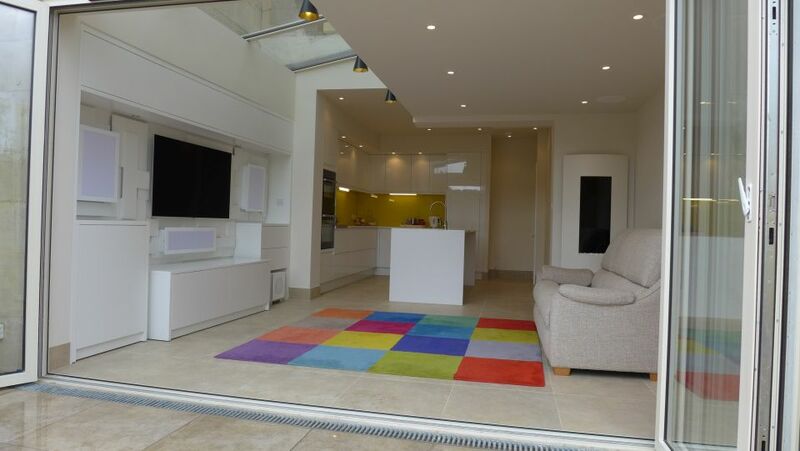 Here is this room when finished, and you can read more in our report on this home renovation in Bristol. You need to support the floor above temporarily, while installing the steel and removing the wall below. This is done with acrow props either using needles or strongboys depending on the method statement. 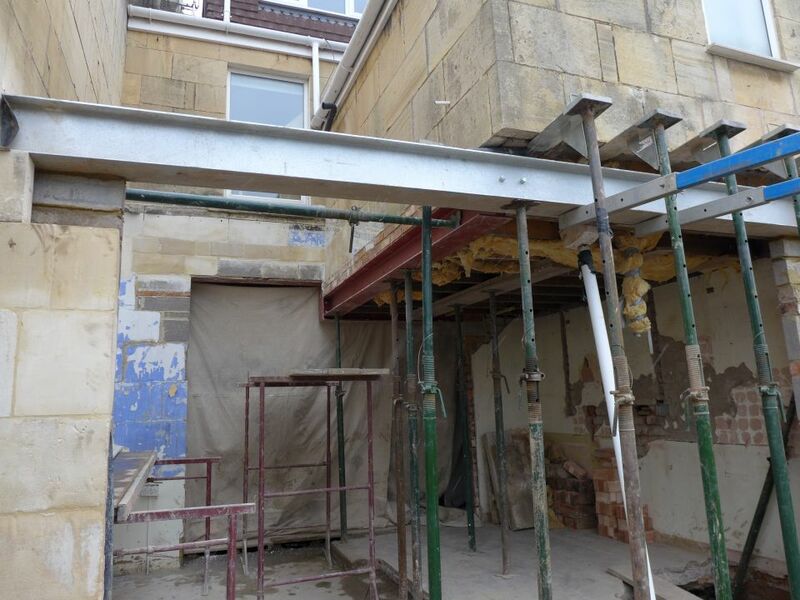 Here is a view of how this extension turned out; because there was a historical steel below the ceiling level, the new steel was also fitted below the ceiling. In the construction below, the contractor used needles (short lengths of steel) with acrow props on either side to support the two skins of the floor above. You can just see the needles protruding on the far side, each supported by two acrows. The ground floor wall is still in place at this stage. The steel was then installed and the wall removed (see below for the view from the other side). You need to remember that needles actually penetrate the first floor room, because you need to support the double-skin wall above the floor from both sides; the steel then slides into the floor space below them. 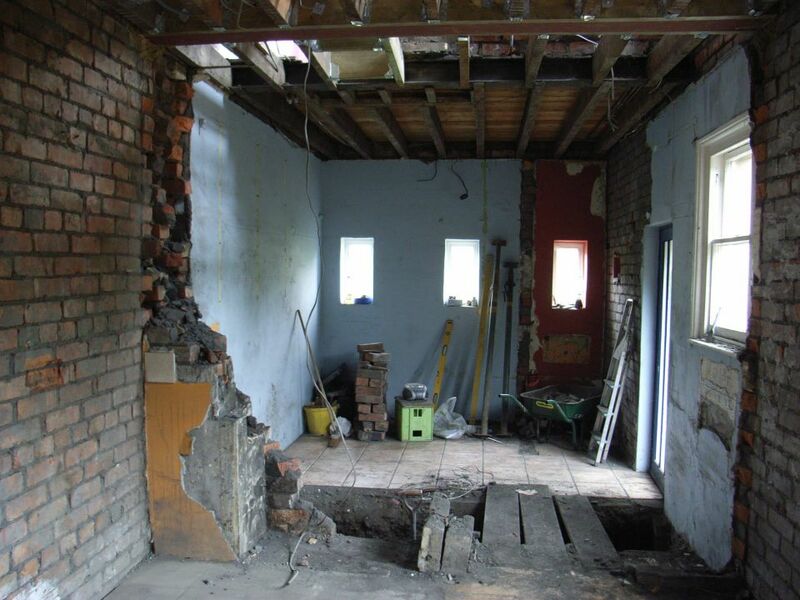 This is a downside of installing the steel within the floorspace using this method; the first floor room will also need to be made good and redecorated. But speak with your structural engineer and contractor. It is conceivable to pick up both skins using strongboys from one side, but it requires extreme care and extra effort. Once the steel is in, the contractor will wedge lead slate (or ram dry pack mortar) into any small gaps to prevent the masonry above from settling and cracking. 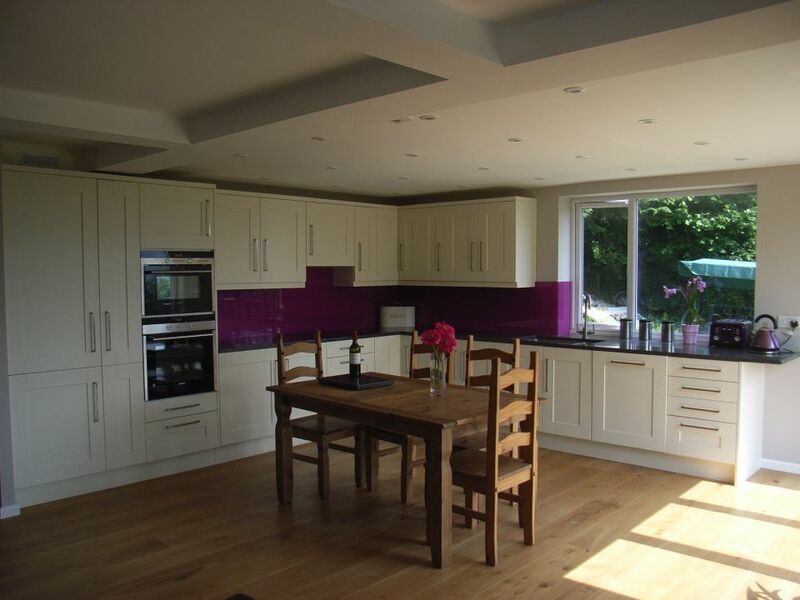 Here is an image of this finished extension. You can also see (or not!) that an additional steel was required (to hold up a bedroom wall), running transversely and forming a T with the main steel. 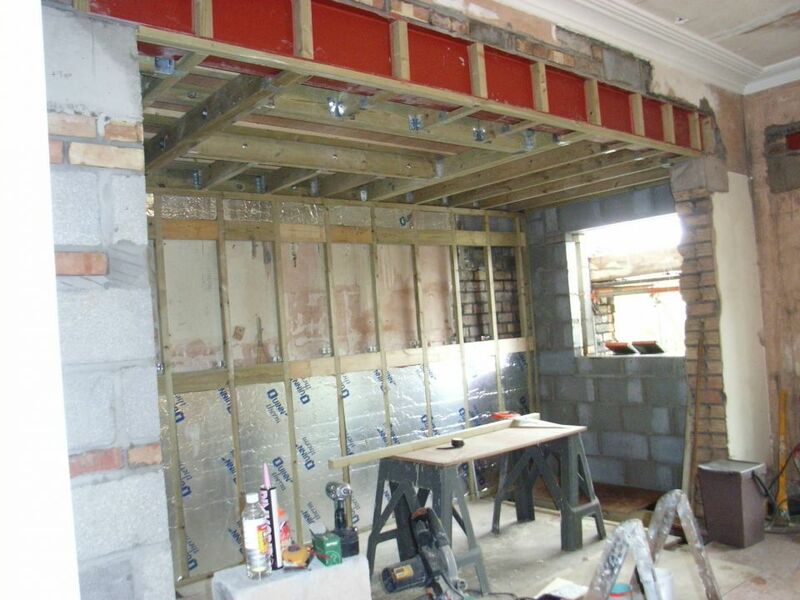 The timber frame in the photos above supported that wall temporarily and was then replaced with a steel; the joists were cut and supported with joist hangers. This steel was also lost in the floor space creating a perfectly flat ceiling. Imagine how different this would look with a downstand across the middle of the ceiling. If you install one large steel that picks up a double skin wall, you should also install a cavity tray above it. Walls that face driven rain are particularly vulnerable to water penetration. Essentially, your large steel prevents the natural gravitational passage of water. Ordinarily, that water would run down the inside of the cavity and dissipate. But because the new steel now blocks off the route, water will pool on it and track across to the inner skin. If it then soaks through, it will spoil the decoration on the inside. To prevent this, your drawing should specify a plastic “tray” across the cavity above the steel. This forms an angled diverter which catches any penetrating water, directs it back to the outer skin and out through a series of weep holes to the atmosphere. 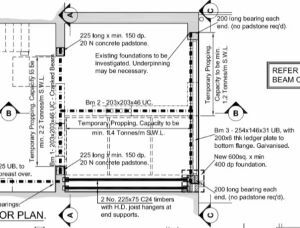 To maintain stability from lateral loads, particularly for a long wall, a structural engineer will require a masonry support pier of around 600mm internal projection onto which the steel will bear. 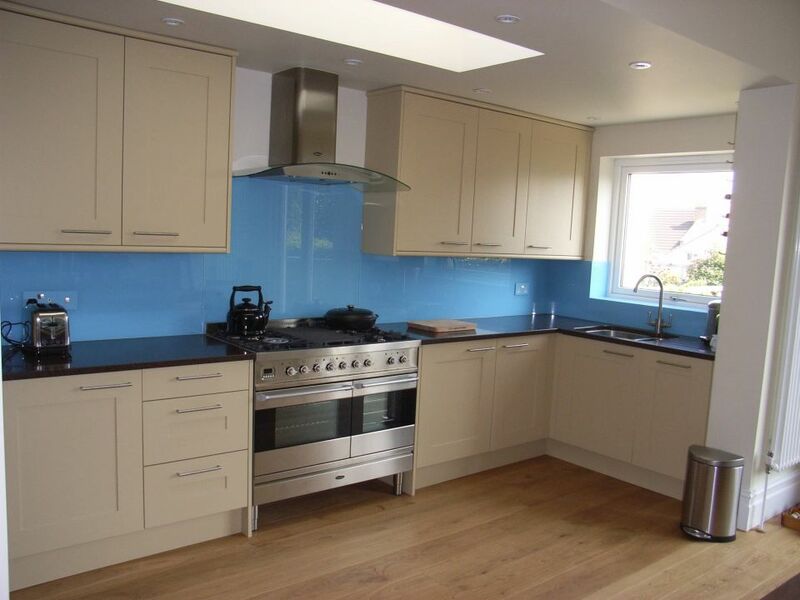 For a kitchen, this is quite convenient as a 640mm return will cover the cabinets and worktop, as in the photo below. However, if you want to minimise any projections to maximise an opening, space or view, you might consider a sway frame design. This has a smaller section and hence is less obtrusive, but is constructed from steel to which the overhead steel is bolted or welded. One example below shows where we wanted to maximise the opening for new french doors in this end elevation. 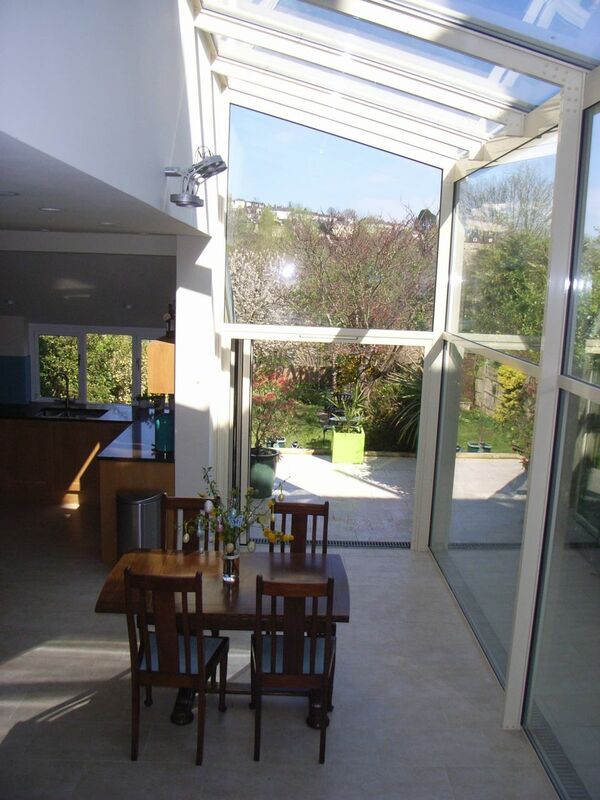 Note the returns of just 300mm either side of the doors, maximising the glazed sections and views of the garden. 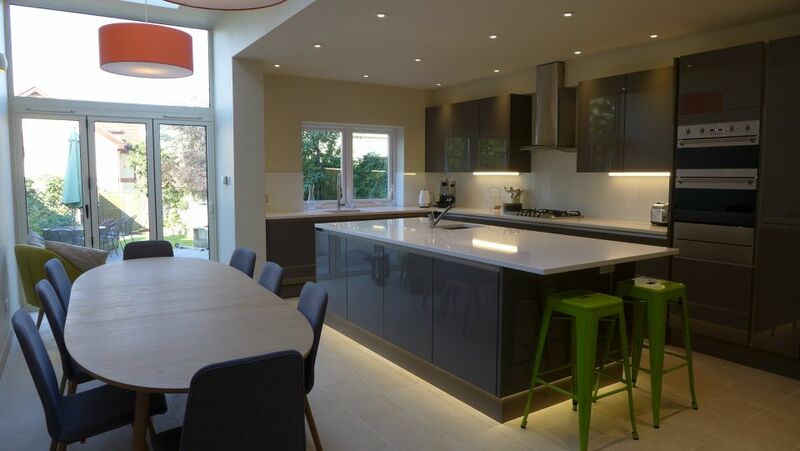 You can read more on our home remodelling portfolio page. We are currently working on a design with a cranked steel to be “lost” in two ceilings and a wall. 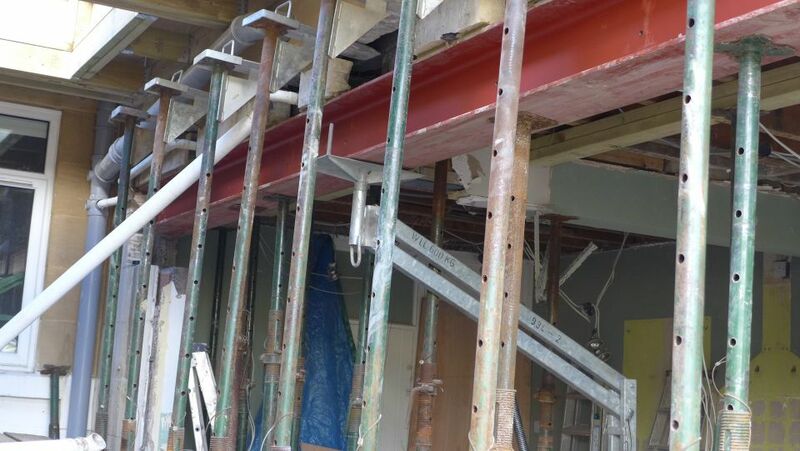 Most steels are single piece and straight, but if you are opening up an area with a difference in ceiling levels, you can install a cranked steel. An example is shown in Section A-A below. A fabricator will make one for you by welding together three or more steel sections. Here is the cranked steel being hoisted into position. Joists at the two different floor heights will sit in the webs of the two separate horizontal steel sections. This current project is also particularly interesting because of the H-shaped configuration of steels required to hold up the first floor (see partial plan view below). We are taking out three ground floor walls to open up the space completely. The three steels were bolted together as shown in the connection detail drawing below. 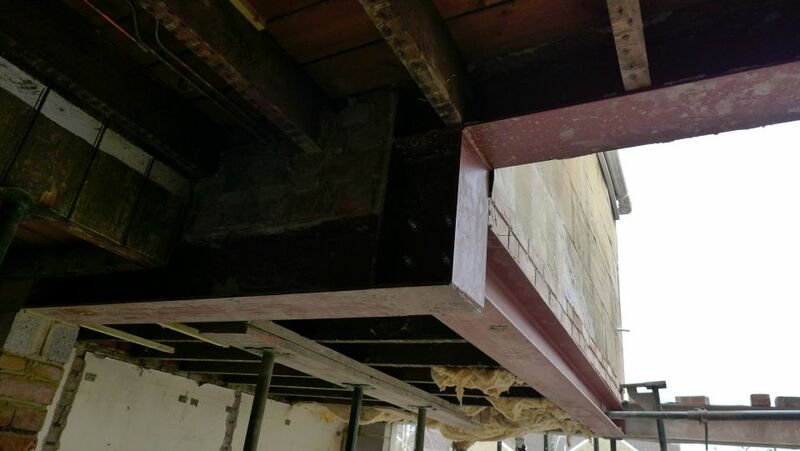 If you need the steel to reach further, the structural engineer may specify a ledger plate – a flat section welded to the base of the main structural member. This would be required, say, to support additional stonework, which is then built up off the plate. 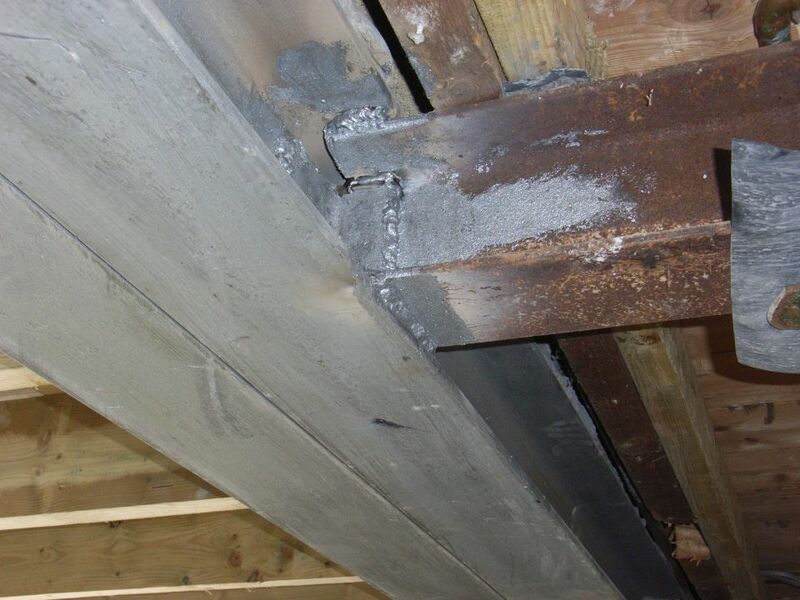 You can see a ledger plate on the galvanised beam (right hand) below. Incidentally, this beam was galvanised, since part of it would remain exposed to the elements. 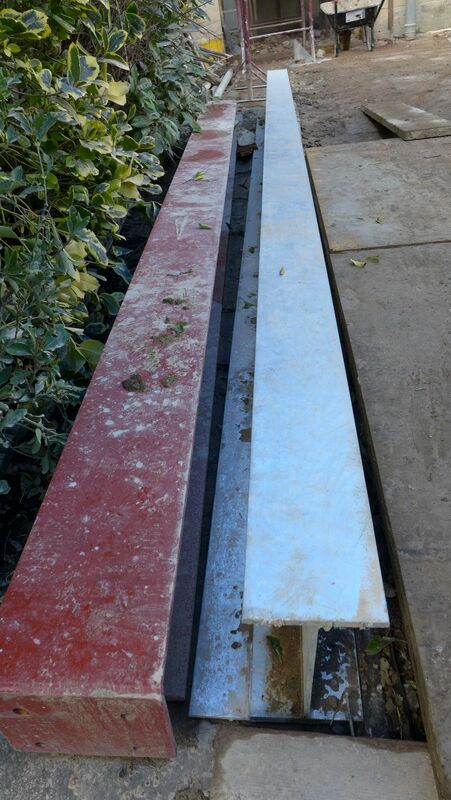 Galvanizing is the means of applying a protective coat of zinc to the substrate metal to prevent corrosion. 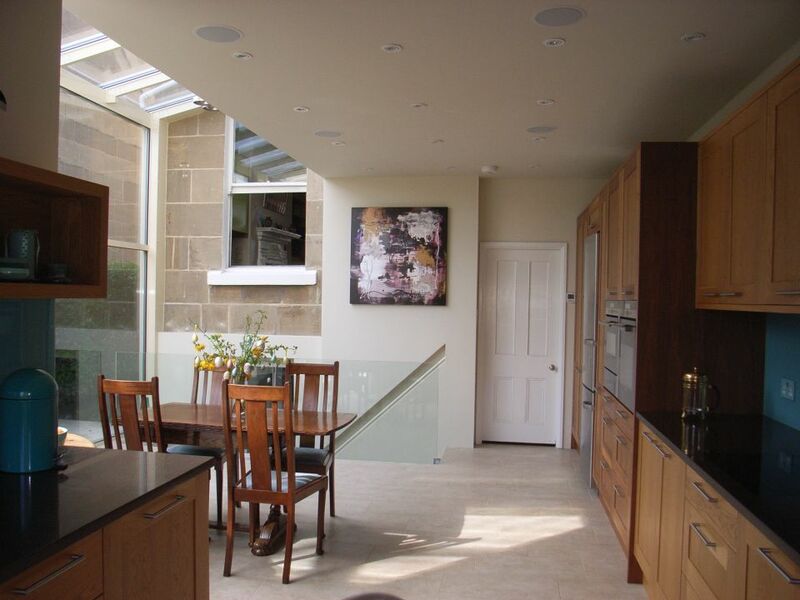 Over the years our contractors have offered optional prices for installing the steel below or within the ceiling. Typically, installation within the ceiling space may add around £1500 + VAT. You should then factor any additional cost for making good the first floor room if needles are used. This can add £500 or so. However the flush design gives a more satisfying finish to the project and is the look you will live with for years to come. 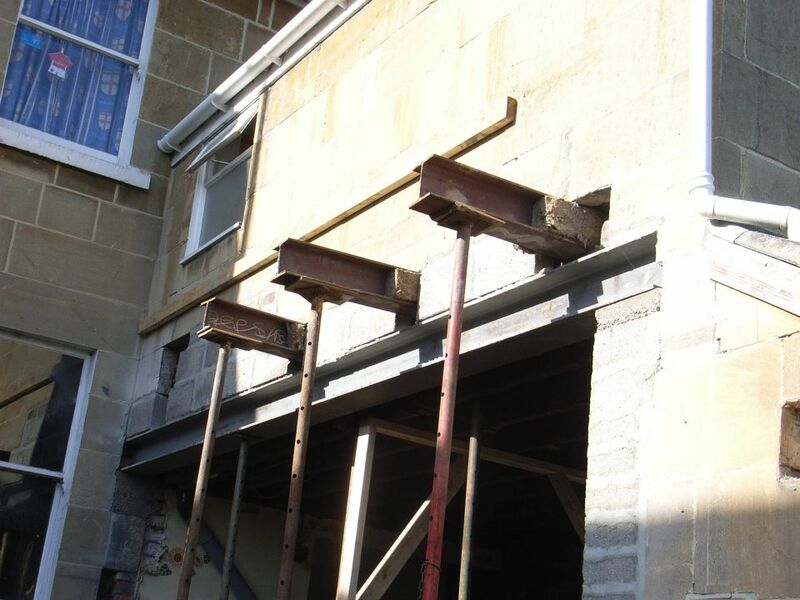 This blog has looked at the principles of installing a structural steel for a house extension. 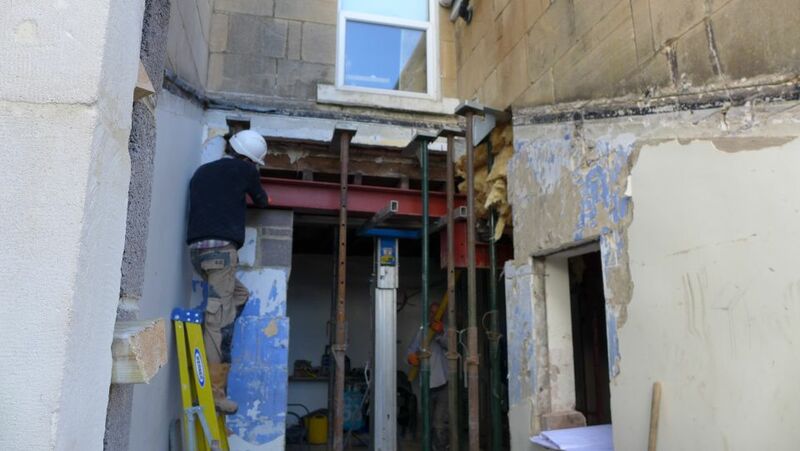 Separately, we look at the cost of installing steels as part of the overall cost of home renovation. 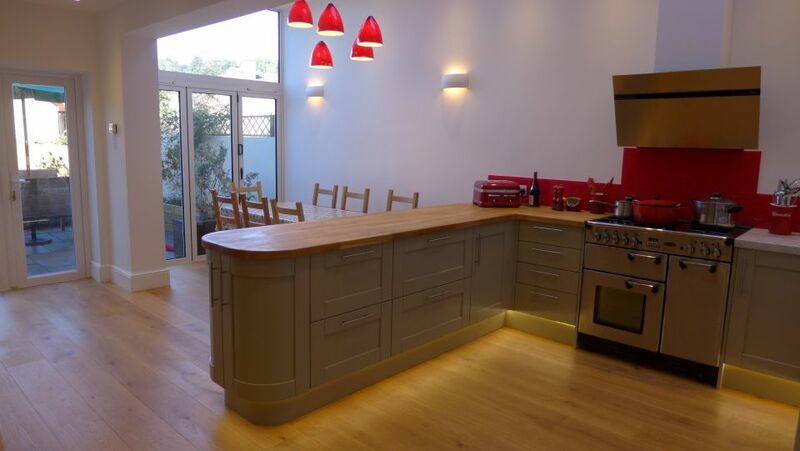 We are specialist home designers based in Bath. 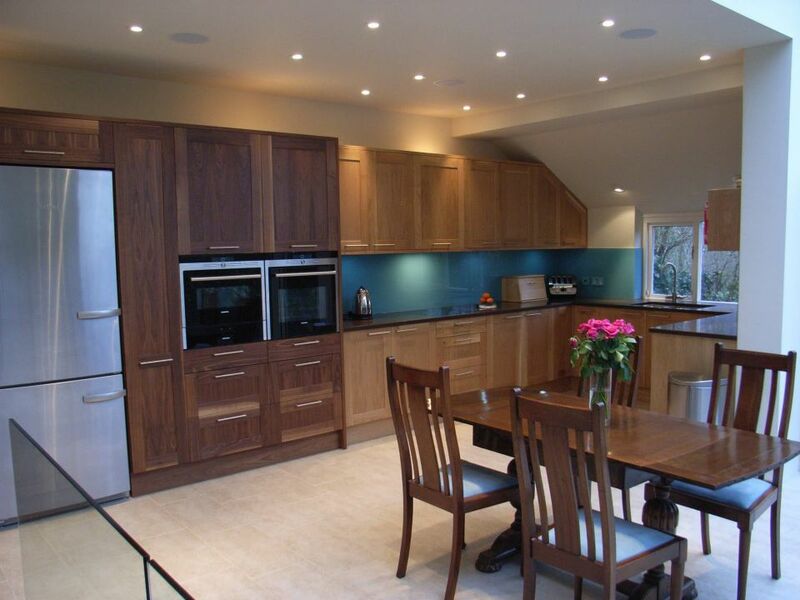 If you think we can help with your home renovation, please call 07711 857670, or send us a message using the contact form.